When you use WeChat to communicate with friends and family members, you can always receive audio messages which save a lot of time on typing for us. It is therefore important to make sure that these audio messages are backed up for future reference. However, sometimes having a backup of the audio messages is simply not enough especially when you need to share them. This article is going to show you two ways to save WeChat Audio messages from your iPhone. Each of these two solutions serves to back up the messages while at the same time making it easy for you to share them with whomever you want. If you need to save lots of audio messages, you may need the service of iMyFone D-Back, an iPhone data exporter that will make it very easy to save all your WeChat audio messages to your computer in just a few simple steps. Before we find out how it works, let's first of all see some of its most useful features. Supports to save 18+ types of iOS content including photos, call history, messages, contacts and even third-party app data such as WhatsApp/Line/Viber/Kik. Can be used to view or extract data from an iTunes or iCloud backup file. Can make a full or partial backup. That means you can separately extract what you need instead of all data. It is very easy to use and 100% secure. No personal data will be leaked out. Here's how to use iMyFone D-Back to save all the WeChat Audio messages to computer. Begin by downloading and installing the program to your computer and then follow these simple steps. Launch the program after installing. 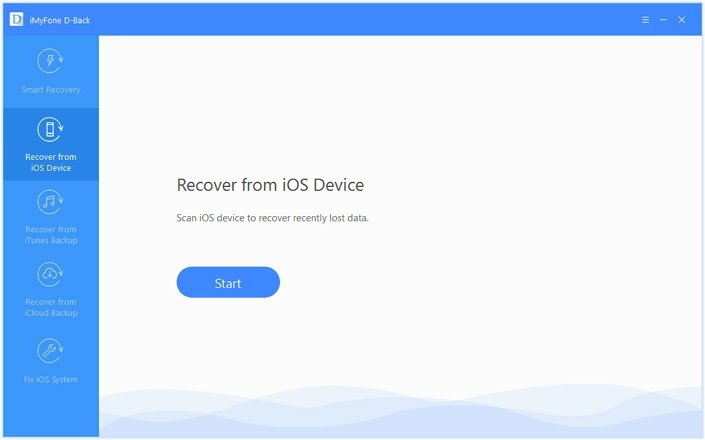 Then select "Recover from iOS Device" from the main window. Click "Start" to begin. Now you need connect your device to computer. In the next window, select "WeChat" under Third-Party IM APP and then click "Scan". When the scaning is completed, view and select the WeChat audio messages you need and then click "Recover" to save them. 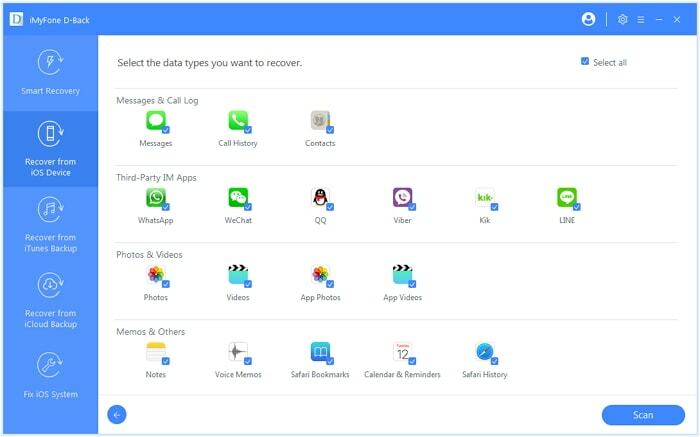 Now download and install the free trial version of iMyFone D-Back iPhone Data Exporter to save your WeChat conversations. Another way to save your WeChat Audio messages is to send them via email. Please note that this solution only works if you have one or two messages to save. Follow these simple steps to do it. Step 1: Open the WeChat app on your iPhone. Step 2: Press on one message for a while until you can see some options. Step 3: Click on the triangle and choose "More". 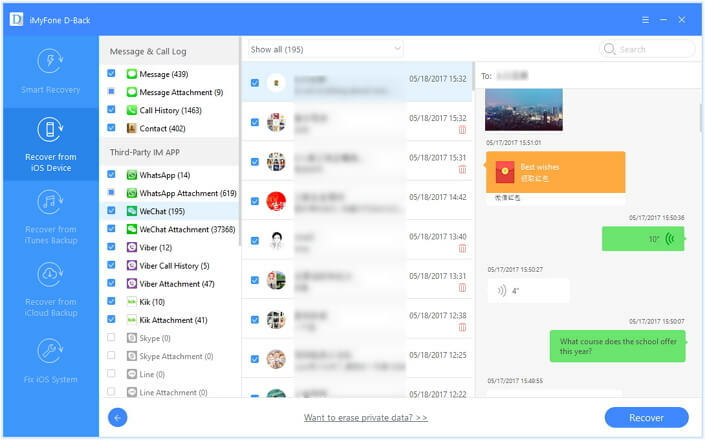 Step 4: Select the WeChat Messages you want to save. Step 5: Click on the Ellipses icon and then choose "Save to Email." Through the two methods above, you can save WeChat audio messages from iPhone. However, not both of them are easy for you. The second one cannot be used if you have many conversations. Here we highly recommend the first option. Do not hesitate and just have a try. Leave your comments below if you have any other ideas.